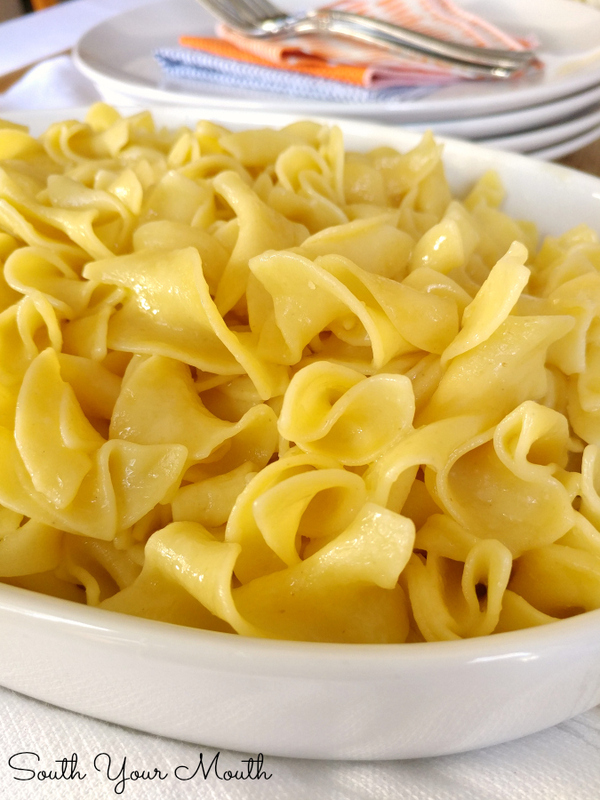 Throw everything in the pot and walk away with this recipe for perfectly cooked, hot buttered noodles that are the perfect side dish for any meal! This is a sponsored conversation written by me on behalf of College Inn®. The opinions and text are all mine. You know when you’re cooking supper and you’re trying to time up everything to be done at the same time AND set the table AND fold that load of clothes before they get wrinkled AND sign your son’s field trip permission slip because it must be done right, by God, now AND answer the phone at the same time? And then you wished you’d just cooked a frozen pizza because ain’t nobody got time for this? Well, that is the precise reason I came up with this recipe because you just throw everything in the pot, boil it a few minutes, pop the lid on and just… walk away. 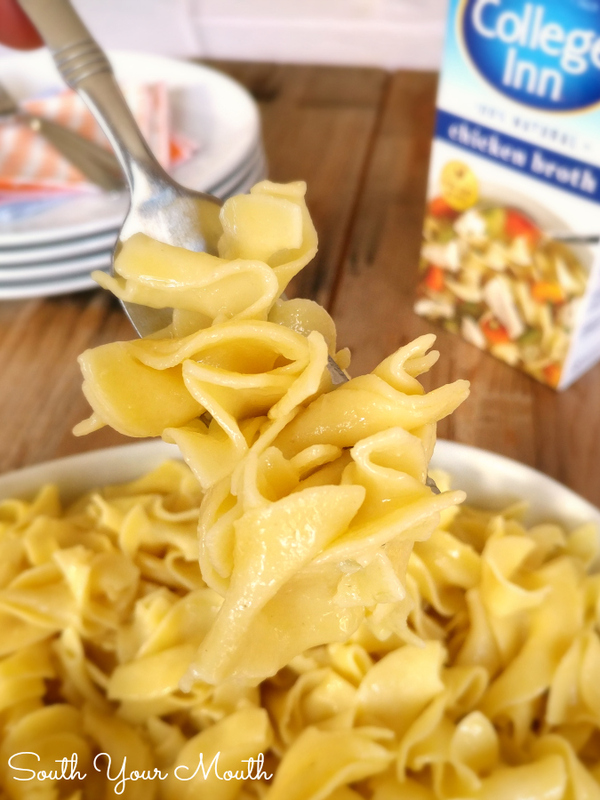 You get to forget all about it until suppertime then are rewarded with perfectly cooked, hot buttered noodles that are the perfect side dish for just about any meal. The broth is what makes this dish both simple and so, so, soooo flavorful. You can use chicken, vegetable or beef broth depending on what you’re serving it with. Because the broth is the key to making this recipe so delicious, definitely make sure you grab a quality broth. 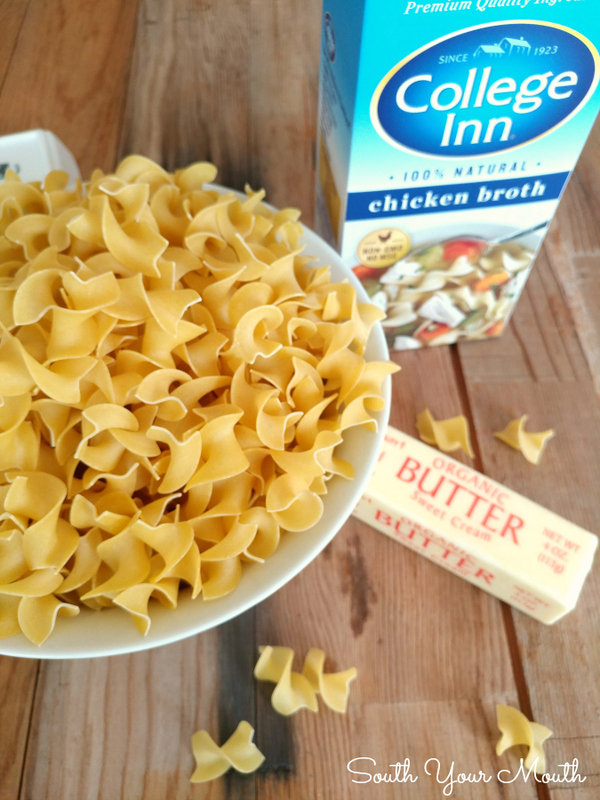 The noodles are going to taste like the broth you use so I always use my favorites from College Inn because their broths have such a deeper, richer, from-scratch flavor that really comes through in the finished dish. Aside from being super easy, another thing I love about this recipe is that it makes a big batch. We have this with supper then I throw the leftovers in the fridge to serve again later in the week. You can also toss some chopped, cooked chicken in there call it supper. Man, talk about easy! If you decide to try out this recipe, share the results by using #CollegeInnBroth on social media! In a large pot, bring broth, butter, salt and garlic to a full, rolling boil. Add noodles and boil, uncovered, for 5 minutes; stirring occasionally. Turn off heat, cover and let noodles set for 15-25 minutes (see notes) or until tender and most of the broth has been absorbed. Stir once or twice the first 5 minutes to make sure the noodles don’t stick to the bottom of the pan. Stir again just before serving. Enjoy! I prefer the “dumpling” or “homestyle” egg noodles but “extra wide” works just fine too. If using the “dumpling” or “homestyle” noodles, let noodles set 20-25 minutes. If using “extra wide”, only let set about 15 minutes.